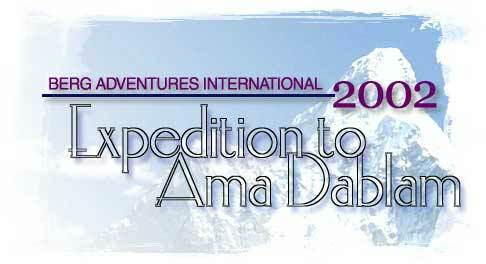 Berg Adventures International: Ama Dablam Expedition Itinerary. Wally Berg calling from Pheriche. We have spent the last two nights here at Pheriche, my favorite hangout in the shadow of Everest, Tawoche, Ama Dablam and the other great peaks of the Khumbu Region. Periche is at nearly 14,000’ so it is a critical place for use to stay long enough to allow our bodies to acclimatize. 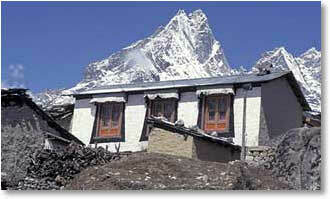 We stay at the Himalayan Lodge, which I have used for expeditions and treks since 1989. We are next door to the Himalayan Rescue Association Clinic (HRA Clinic). This years HRA physicians, Eric Johnson, from Idaho and Peter Kendrick from the U.K. by way of Taiwan, have made us feel more than at home with their hospitality, good stories and laughs shared during the cool, sunny days at Pheriche. The sky is deep blue, the peaks are awesome and the fellowship with good friends is golden. 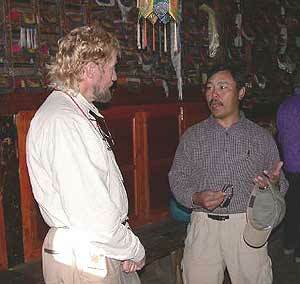 You may remember the Ginkoba / Diamox study that some of the trekkers on the BAI Everest Base Camp Trek participated in. The same study is still underway and Garry and Ryland are participating. The medical students, Jeff, Allison, Danielle, and Joanne and Amy are still around, doing their great work and looking more comfortable in this mountain environment as the weeks pass. Yesterday, the climbing Sherpa, Kami, veteran of an Everest summit on the National Geographic Expedition last Spring and of two trips to Kilimanjaro to work on the IMAX film, Kilimanjaro, Hiked above Pheriche with Garry for some exercise and some views of surrounding peaks. Doug joined them on the ridge later, and, as usual Ryland found some solitude in a high and beautiful place on the ridges above the town of Pheriche. We also futzed with our harnesses and climbing gear in the warmth of the “atrium” room of the Himalayan Lodge, sunlight through large glass windows. It is virtually always windy in Pheriche, so this felt very nice. David and Brent hiked over to the village of Dingboche, over the ridge and about ½ hour’s walk. They found good company in the Snowland Lodge in Dingboche and returned to Pheriche in time to enjoy fresh bread and yak cheese and tomatoes sandwittches prepared by Wang Yuan Ling, Dr. Peter Kendrick’s wife. Only moments later, we were all being fed another of Pasang, our cook’s, wonderful meals back at the Himalayan Lodge. One of the sure signs that an individual is acclimatizing well is a strong appetite and I am pleased to report that every indication for this group is that acclimatization is going to be no problem. Pasang’s great cooking (we had Pizza last night) accompanied by San Miguel and Carlsberg beer is our evening ritual, followed by an early bedtime (before 8:00PM). Life is good on our acclimatization trek through the Khumbu. I should mention that we will be leaving for our first climbing objective, Loboche Peak. We can look up the valley from here in Pheriche and see this challenging looking peak It is 6119 meters (20,080) feet high. Back in Kathmandu, Wongchu from Peak Promotions acquired a permit for Berg Adventures to climb Loboche, as well as Ama Dablam, because we feel it will be a good warm up and acclimatization climb before Ama Dablam. Nima Tashi is over on Ama Dablam making trips to Camp I on our route on the SW Ridge to prepare for us to move onto that climb. 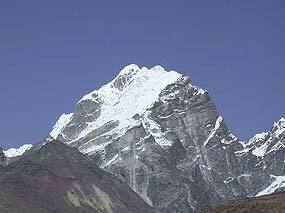 Meantime we will enjoy moving up past the Khumbu glacier today, and attempting another beautiful climb to prepare ourselves for Ama Dablam.